I'm so happy to be able to work with Teleflora because I have been their customer for years. Teleflora and I have a long history of sending flowers to my Grandma. My grandma is 95 years old. 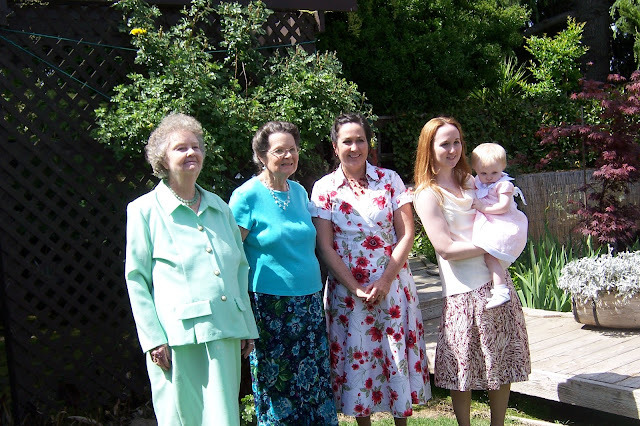 This picture was taken on her 90th birthday. I don't get to see her very often due to the miles between us, but every year at Christmas I send her a centerpiece for her annual Christmas party. It makes me happy to sit at my computer looking at all the beautiful flowers on the Teleflora web site and decide just which ones she would like the best. The flowers always arrive on time, fresh and lovely, and Grandma loves them. This year, I've decided that I need to send her flowers for her Halloween party. She's 95; I don't know how many more flower-sending occasions there will be, so I'd better take advantage of them all. And isn't it sweet that she's still throwing parties at 95? Okay, there will be about 5 guests, and my uncle will do all the work, but still. It's her idea and her party. And I'm sending flowers. I love the orange glass vase and orange roses contrasted by the white of the daisy spray chrysanthemums. It's just so bright and cheerful! It has been said that it is better to send flowers when a person is alive to enjoy them than to send flowers to the funeral when it's too late. I've tried to take that philosophy to heart. I hope Grandma enjoys her Halloween flowers, and I hope she's still here to enjoy Christmas flowers again this year. To whom should you be sending flowers? 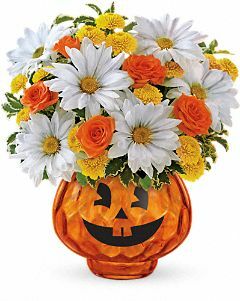 Of course, Teleflora has lots of other Halloween flowers, so be sure to check them out. Disclosure: This sponsored post was made possible by Mom Spark Media. I was compensated for my time investment and work on this campaign. Thoughts are my own.